Download "Frequently Asked Questions (FAQ) on HSBC Chip Credit Cards"
2 do not know the PIN of your existing credit card, you could call HSBC PhoneBanking to request for a new credit card ATM PIN. 5. Can I use the HSBC Chip credit card for online transactions as well as at Point Of Sale (POS) terminals? Yes, you can use the HSBC Chip credit card for POS as well as for online transactions at websites that accept Visa/MasterCard credit cards. Online card usage will require authentication of the transaction by entering the 6 digit OTP (One Time Password). HSBC has rolled out an SMS OTP functionality for easier use during both online and IVR transactions. If you had previously created Verified by Visa (VBV)/ Mastercard SecureCode (MSC) passwords, you can no longer use them. Instead, the HSBC SMS OTP authentication service will automatically trigger authentication for your online/ivr transactions via the SMS OTP. Please refer to the FAQ on Implementation of SMS OTP authentication for Primary and Add-on cards for further details. Usage at POS terminals present at merchant establishment will require you to input your 6 digits ATM PIN number, to validate the transaction. Incorrect ATM PIN will not validate the transaction and the same shall not be processed. In case you do not have an ATM PIN, please place your request for the same on HSBC Phone Banking /HSBC Personal Internet Banking. You may also visit your nearest HSBC Branch and place a request for an ATM PIN. Upon request the ATM PIN shall be sent to your mailing address. 6. Can I use the HSBC Chip credit card overseas? Yes. Depending on the capability of the overseas POS terminal, you may be required to validate your purchases using your 6-digit Credit card ATM PIN in addition to signing the sales slip. 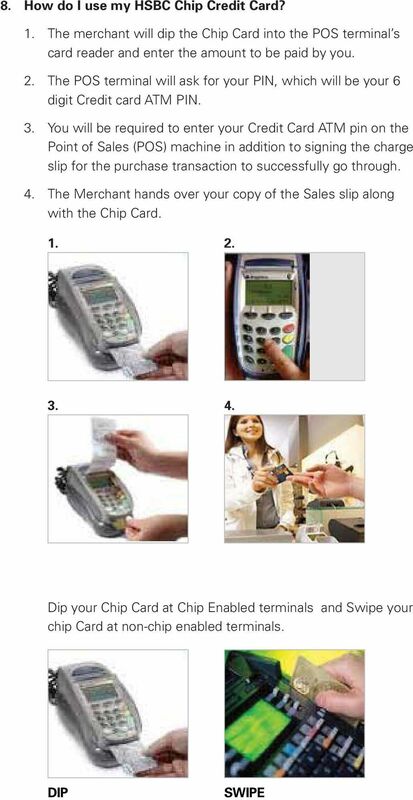 Please note, in some countries chip cards are not prevalent and not all POS terminals can accept chip cards. Your card transactions in these countries will revert to using magnetic stripe instead. 7. Would the HSBC Chip credit card be accepted by all merchants? Yes. The Chip credit card also has a magnetic strip to ensure acceptance even at merchants whose POS terminals do not have Chip card capability. Hence the HSBC Chip credit card can be used at most card accepting merchants in the same way as the magnetic strip cards are used. 5 entered and the card account having adequate limit, the transaction will be approved. 5. On transaction approval, the website will display a payment received acknowledgement. In case of an IVR transaction, the merchants IVR system may play out a payment acknowledgement message. 6. A transaction alert will be sent to your registered mobile number confirming the successful transaction. FAQs on SMS OTP authentication for Primary and Add-on credit cards: 1. Why is there a need for a One-Time Password (OTP) to complete an online transaction with the HSBC credit card? The OTP helps to protect against online frauds. It is a secure way to authenticate that the customer making the online transaction is the rightful owner of the card being used. 2. Will every website require the OTP to be entered for authentication? No, you will be asked to enter the OTP only if the website supports Visa/ MasterCard credit cards for online transactions and supports the Verified by Visa (VBV) or MasterCard SecureCode authentication protocol. Support for VBV or MasterCard SecureCode is usually indicated by the following image on the website: Please note that, two factor authentication is compulsory for online transactions originating from websites/internet merchants in India. The authentication is done using the Verified by Visa or MasterCard SecureCode authentication service as explained above. In case you initiate an online transaction from an Indian website without Verified by Visa / MasterCard SecureCode authentication, the transaction will be declined. 3. I am using my HSBC credit card at an overseas website, do I need to enter the OTP for authentication? If the website supports VBV/ MasterCardSecureCode authentication protocol, our system will automatically send you the OTP by way of an SMS for authentication at the payment stage. 7 HSBC to send you an OTP or transaction based SMS alert, please ensure that your new mobile phone number is updated with HSBC at the earliest. 9. Can I opt out of the OTP authentication service for online transactions? No, the OTP is mandatory for authentication at websites that accept Visa/MasterCard credit cards and support the Verified by Visa/ MasterCard SecureCode protocol. 10. Do I have to pay for this service? No, you do not need to pay for this service. 11. I have an Add-on card, do I need to update my mobile number to receive the OTP? Yes, please register your mobile number with HSBC so that you are able to receive the OTP for online transaction authentication and also to receive transaction alerts. You can call the HSBC Phone Banking number for immediate updation of the mobile number. The records will be updated subject to successful verifications. 12. What happens to the VBV/SecureCode password I had created on Internet Banking for my primary card? You will no longer be required to use the VBV/Securecode password created on Internet Banking. Instead, the HSBC India SMS OTP authentication service will automatically trigger authentication for your online/ivr transactions via the SMS OTP. 13. How does a Primary Card holder / Add-on card holder unlock his VBV / MSC in case it gets blocked? Primary Credit card holders can login to Internet Banking and unblock their VBV / MSC password incase it gets blocked due to three incorrect attempts. Add-on credit cardholders can call the Phone Banking numbers to get their VBV / MSC unblocked. 14. Does this change to SMS OTP mean that the earlier method of password generation was not secured? No, the earlier process for password generation was also secure. SMS OTP is a convenient option being made available to you so that you do not need to register separately to be able to use your card online. 8 15. Do I have a choice to continue using my passwords instead of the SMS OTP option? No. This option will no longer be available. 16. How will SMS OTP function for replacement card issued in case of lost / stolen / Upgrade or renewed cards? If there is no change in the mobile number, you can start using the SMS OTP authentication for online transactions even after the card has been replaced as lost / stolen or on upgraderenewal. 17. After I update my mobile number with HSBC, can I start using my card for e-commerce transactions immediately. 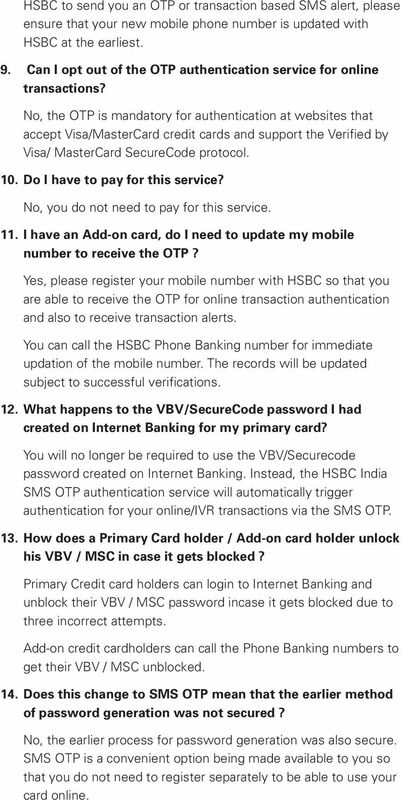 Yes, you can start using the card immediately after you have updated the mobile number with HSBC. 18. I do not see my Personal Assurance message after the SMS OTP launch, how do I know if it is safe to use the website? Personal Assurance Message is not applicable after roll out of SMS OTP functionality. The transaction continues to be authenticated in a secure manner through VBV or MasterCard SecureCode indicated by the following image on the website: CC_CHFAQ_03/14 Issued by The Hongkong and Shanghai Banking Corporation Limited, India (HSBC). Incorporated in Hong Kong with limited liability. VISA card holders can directly contact the account issuing bank about Verified by VISA to make your credit care even more secure. iii. You will not be able to access their iocbc account without a valid OTP token from 1 Nov 2012 onward.